“¡Qué bonito es despertar en una casa llenita de animales! A few years ago, thanks to the LAMC in New York City, we were introduced to the pop cuteness of twin sister duo Las Acevedo. 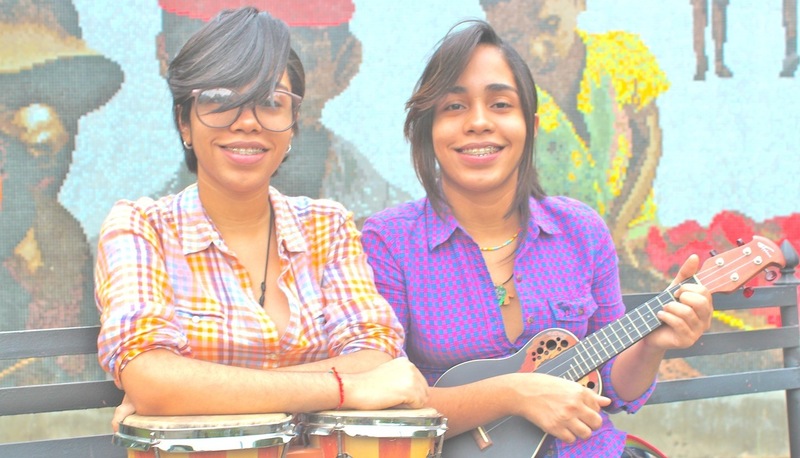 The ladies from the Dominican Republic began their young music career through hom-made videos of the quirky pop songs they self-recorded which they eventually shared with friends on Facebook and YouTube. After the well-received reaction at their first public appearance they decided to officially form a band. 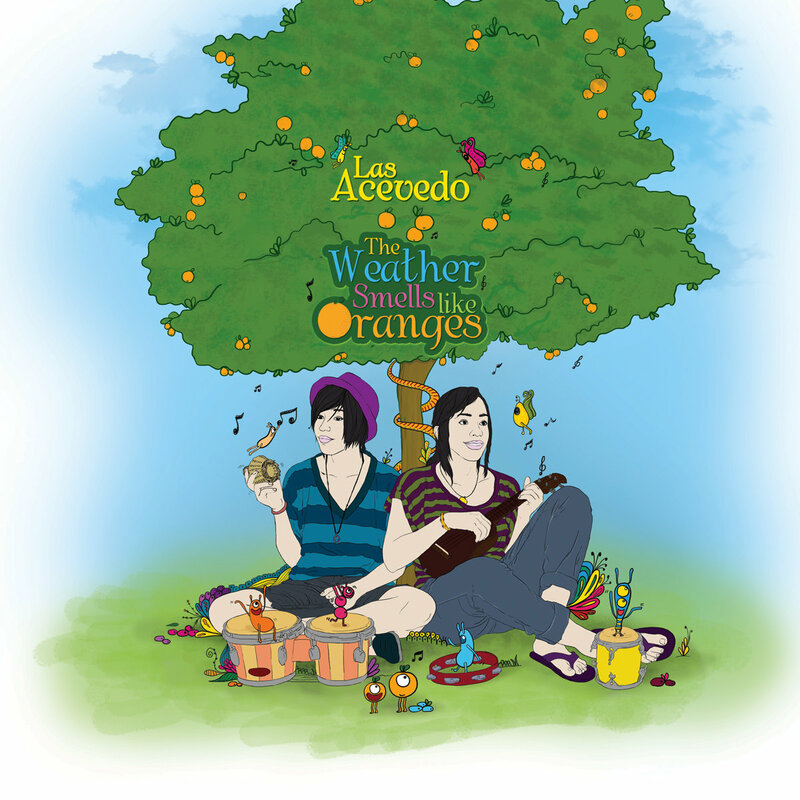 Las Acevedo then began to self-produce, master and record several EPs in their home studio including their latest release Fiesta en La Vitrola. Anabel and Cristabel Acevedo’s music is an ode to all good things. With a guitar, ukulele, bongos and assorted maraquitas accompanying their beautifully harmonized vocals, the simplicity of their art overflows with enthusiasm. We first heard them at SOB’s where they had the audience all smiles and “chaka! chaka!” with their mini-acoustic presentation. Actually, one of their first video creations was for the single “Chaka! Chaka!” which was the introduction of their vibrant attitude about life seen through rose-tinted glasses. How much sweeter can you get? Check it out below. The song is off their EP and our personal favorite picnic-pop song by the same name, The Weather Smells Like Oranges, which they released in 2012. They also created beautiful renditions of two of Chavela Vargas’ songs, “Rayando El Sol” and “Lamento Borincano” which appeared on the tribute album La Chamana. In the summer of the same year, Las Acevedo produced their second set of recordings Homemade Cookies, a five-song EP along with the single release of “La Playa.” Las Acevedo have been performing regularly ever since beginning with a set at the Vive La Canción Festival (Spain) sharing the stage with artists like Ana Tijoux and Jorge Drexler. Last year, along with the love driven four song recording Fiesta en la Vitrola, they also released the Niño Van collab “Abrazame un Pie” which features Efrain de la Rocha (guitar, vocals, hand percussion) and Karyna Niño (accordion, vocals, hand percussion). Las Acevedo’s’ evolution continues its unique streak and it’s evident in each of the four new songs. We’re exposed to more mature, darker lyrics with new fusions of bachata, boleros and jazzy tropicalia. Each song endearingly begins with the sounds of a vitrola playing in the background. Anabel also took on the task of gathering 11 musicians to put together a love compilation, Me Derrito Por Ti, which allowed us to listen to each hand-picked artist’s musical interpretation of the sentiment. Some of the participating artists include Ulises Hadjis, Andres Landon, Leo Hunt and even Jessy Bulbo. It’s unconventionally romantic. Anabel also has a side project called Yo Soy Mi Hermano. It’s really gritty and good. The alt-pop goddesses continue to produce their own music as well as collaborate with other musicians. They haven’t allowed any obstacles to get in their way and have proven once again that with perseverance, along with talent and a positive attitude to match, anything is possible. The message is simple and we have to keep repeating it to make it the norm. As young as these ladies are they’re proving their wisdom beyond their years. Let’s support their growth!